In 1967 David Floody watched from the Canadian shores of the Detroit River as the fires of racial hatred consumed Detroit in a five-day riot. That unforgettable experience became the basis for his novel The Colour of Pride. David will give a brief overview of the riot, of his experiences attending an integrated high school and something of the art and culture of Motown in the mid-sixties. David will read short excerpts from the novel to reflect the storyline: A year after the Detroit race riot, fourteen-year-old, White Canadian ballplayer, Frank Phelan, befriends and defends Black, fourteen-year-old Detroit Junior Tigers pitcher, Ellie Fitzgerald, from a racist bully at the 1968 World Series, and must confront his values in doing so. David will sign copies of the novel at the conclusion. There will be drinks available for purchase. David Floody is a Canadian, young adult novelist living and writing in Tofino, British Columbia on the far west coast of Vancouver Island, in breathtaking Clayoquot Sound. His young adult novel, The Colour of Pride, is set in 1968, a year after the David witnessed the fires of racial hatred consume Detroit in a five-day riot. 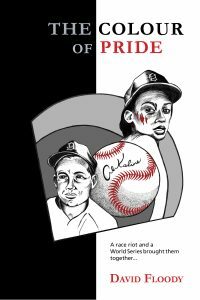 White fourteen-year-old ballplayer, Frank Phelan, defends and befriends black teenaged ballplayer, Ellie Fitzgerald, from a brutal racist bully during a crucial game of the World Series. David is working on a sequel.